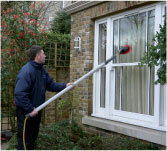 H2O Window Cleaning - professional window cleaners. How to pay. "We've been impressed by the consistency and quality of the service, our windows are cleaned regularly and well "
"The same two gents come round every 4 weeks and this is the first time that my windows above my large conservatory have been cleaned as all other window cleaners are unable to." "This is a window cleaning service that demonstrates real enthusiasm for the work, a high standard of personal service, a care for customer relations and an approachable and considerate team. The best window cleaners I have ever had; I recommend them wholeheartedly." "Excellent job - nice to see out properly!"